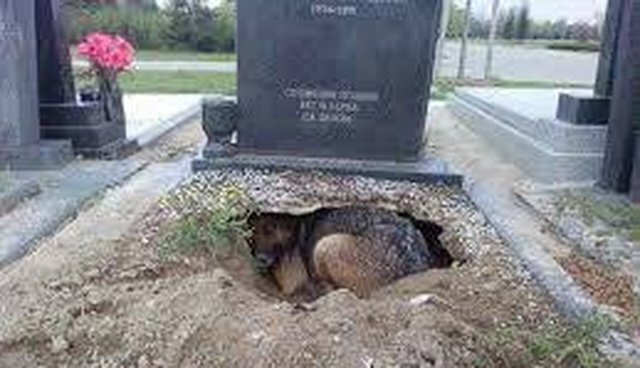 A heartbreaking photo shows a dog curling up in a crevice he dug by a grave. Although many interpreted the photo to show a dog mourning his owner's death, a Dodo commenter pointed out that the photos are likely of a stray dog. A google translation of a German rescue group's Facebook page suggests this dog may be a stray who dug this hole and gave birth to puppies here. Another Facebook user's photo album features a series of photos suggesting the puppies may have been rescued. Many dogs have sat by the side of their owner's grave though. In 2013, a video of a husky seeming to cry at the grave of a beloved grandmother went viral, and debate ensued about whether the dog was really grieving. Read more about the emotional lives of dogs here. Learn how you can help stray dogs in need here. CORRECTION: A previous version of this entry suggested the dog was mourning his owner. It is unclear why the dog was near this grave.